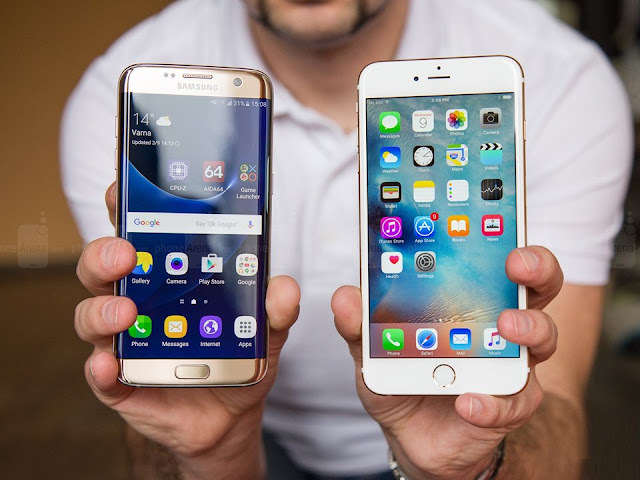 Home » News » iPhone 6S vs Samsung Galaxy S7 Edge: Which One Is Better? With the Release of Samsung Galaxy S7 Edge, there starts the new debate about which one’s better, iPhone 6S or Galaxy S7 Edge? Selecting the smartphone for purchase is not that easy task that it was used to be once. The markets are loaded with the number of brands out of which only two leading brands comes out that are Apple and Samsung. Now Galaxy S7 Edge has been out and to find out which one’s is better, I am going to give you the comparison of their features of which you need to select which one’s better. Here is the step by step analysis of Samsung Galaxy S7 Edge and iPhone 6S. Fasten your seat belts to go through the war between iPhone 6S vs Galaxy S7. Both of them are counted among the best looking sets on the market but there is not any remarkable change in design in each phone from their predecessors. iPhone 6S: the body is made 7.1 mm thick with the Series 7000 anodized aluminum body. Galaxy S7 Edge: 7.99 mm thick metal alloy body with gorilla glass back and front and a beautifully curved screen. The glassy look of the Galaxy S7 Edge made its look feel premium but its design didn’t completely beat the iPhone’s. The series 7000 aluminum is much tougher and elegant than any other phone on the market today. Well, this comes as no surprise that the display of Galaxy S7 Edge is just similar to that of the S6 Edge and indeed it is really amazing. Yet, on a comparison, the display of S7 Edge is radically sharper, curved and iconic than iPhone 6S. iPhone 6S: 4.7-inch IPS LCD, 1334 x 750, 326ppi with 3D Touch. The Galaxy S7 Edge display is noted for its amazingly sharp looking display with deep blacks and bright rich colors. The size and weight of this set is only a fraction bigger than iPhone 6S. In contrast, the display of iPhone 6S is sharp but it still doesn’t pass that of S7 and its display features. As compared to their ancestors, both the sets are having better performances without any crash or hardware issue. as the Samsung claims, whatever chip you got in your S7 Edge, it will surely give you 30 times better performance as compared to that of GS6 Edge. The phone’s got the memory upgrade as well as that of the performance. With this in mind, the GS7 Edge is best one to run games either they are 3D racing ones or 2D puzzles. And on the comparison, iPhone has got the hardware that is somewhat equal to that GS6 with the bit exceeded general usage. At the performance as well, Samsung Galaxy S7 holds the advantage. No doubt that both the phones have got the best line in cameras. But, on comparison, it seems like one has got limitations. iPhone 6S: 12-megapixel rear camera with 5-megapixel front camera. Samsung Galaxy S7 Edge: 12-megapixel back camera with 5 MP front. As a matter of fact, galaxy S7 has reduced its pixels down to 12 MP but there is the vast improvement in its camera results. With its aperture, dual LED Flash, and shutter timing, the image quality has been improved far from Galaxy S6. While its competitor is having other unique features that make it difficult for Galaxy S7 to win in this section. The camera of Apple’s 6S is having best autofocus system that has hardly seen in any other smartphone. Besides this, the color accuracy and the general look of the image taken from iPhone 6S remains one of the best snapping business. Both the sets do not have the option for the removable battery but when it comes to battery life, SGS7 wins the race. It is quite clear from above statements that galaxy S7 is having pretty larger battery timing as compared to its rival. But as the battery timing depends on the display, operating system usage and lot more, it would quite be unfair to declare a winner here. Samsung S7 has shipped with the Android 6.0.1 Marshmallow and Samsung TouchWiz skin that unfortunately cannot pass iOS. iOS, as always, remain the simplest and easy to upgrade software. So here, no doubt, the win goes to iPhone 6S. I will leave this decision up to you. With such amazing features both the phones have got reasonable prices. From the above comparison, the fact comes clear that Samsung Galaxy S7 Edge is an absolute beast that have survived to provide its users all the amazing features like camera, performance and design. And of course, it is the worthy rival to iPhone 6S. Let us know how you think about iPhone 6S vs Galaxy S7 Edge in the comments section below.